Description: the T-Rex stands in an aggressive posture, its head curved to the left and its arms outstretched as if attacking something. The tip of the tail is bent pointing upwards and to the left. The majority of this Tyrannosaurus figure is painted basic green, while the belly, throat and base of the tail are coloured beige. A series of thick dark green spots and dots are found all over its body in a seemingly random and asymmetrical pattern. On its snout and above the eyes the Rex sports red colouring. It has small yellow eyes and white teeth (inside of the mouth not painted), as well as black claws on both arms and feet and a white JP III logo on its left upper leg. Its feet are supported by extra small plastic bases in the same dominant green colour, so it can stand on its legs more easily. The Spinosaurus is positioned in a crouching move, its right arm resting on the ground, possibly stalking potential prey. Its left arm is raised upwards and its mouth is opened wide. It too sports a paint job dominated by a single shade of green, while its sail features a darker green colour, which ends in a stripe running over its tail as well as smaller stripes running over the flanks and dots on the side of the upper part of its tail. Additionally this Spinosaurus has similar dark stripes on its lower arms and legs and the same colour is also found all over the head. Yellow colouring adorns the back of the head, while a single yellow stripe is found on each flank. The figure has white teeth (inside of the mouth not painted), small red eyes with yellow eye lids and a white JP III logo on its left upper leg. Its claws are not painted. Analysis: the most obvious type of camouflage is the one featuring different hues of green to avoid detection in a forest environment featuring heavy plant growth. A swamp usually qualifies as such, so it's no surprise to see this duo of carnivores adapted to a green environment. This swamp 2-pack is probably the least original of the CamoXtreme sets and also doesn't feature the most appealing paint schemes. Both paint jobs are far from wildly imaginative. The Rex's especially is rather dull, except for the red colouring on its snout which hints to its bloodthirsty nature. Though Hasbro didn't forget to paint its claws, like they did on the Spinosaurus, the inside of the mouth is sadly forgotten (also on the Spino). The pads on its feet are still more of a nuisance than a useful tool and plenty of Rexes keep falling over despite them. On both figures, the white JP III logo looks totally out of place: a black logo would have made more sense, even though it would be harder to spot. Spinosaurus has a more intricate paint job, but only on the top half of its body. Its underside has been totally neglected, apart from the cute little dark green stripes on the lower arms and legs. The two shades of green work well together but that doesn't apply to the yellow colouring which would more easily reveal this creature in a swampy setting. The coloured eye lids are a nice surprise though, since those are usually ignored on dinosaur paint jobs. This is the lesser of the two small JP III Spinosaurus figures Hasbro produced (the whole crouching pose just feels un-Spinosaur like), but its addition to the CamoXtreme line instead of repainting the other Spino figure again does add a little more diversity. Incidentally, every once in a while a Swamp Raptor figure is mentioned. This refers to the unreleased CamoXtreme Tropical Velociraptor, a JP III Wave 2 Pack Raptor repaint which featured a similar paint job to this set (as far as we could tell from the only known picture), but was never actually named a Swamp Raptor, so technically - and literally - this figure does not exist. Repaint: yes. Both figures were originally featured in the JP III toy line. 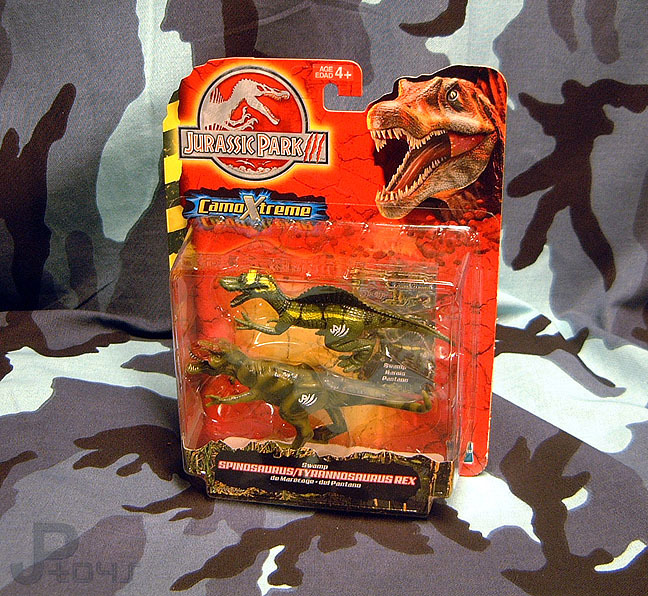 The Tyrannosaurus came with the Military General figure in Wave I of that line, while the Spinosaurus was released later on along with the Military Diver figure for Wave II. Both dinosaur figures would be repainted again for JP Dinosaurs 2/3 and JP 2009, the Spinosaurus not nearly as frequently as the T-Rex though (in fact, it was altogether absent from JPD3). Overall rating: 5/10. If you don't own the original JP III sculpts yet this set might be interesting for you: if not, it's really nothing special, except for the new collector's card completing this set. The CamoXtreme 2-packs are a bit harder to find than most other Hasbro JP dinosaur 2-packs, but not (yet) excessively so. You can still find them irregularly on eBay for a fair price. These 2-packs were imported in the Benelux in decent quantities, making them also fairly easy to find there.